As well as the rush of adrenaline that you get from cooking on an open fire there is something exhilarating bout watching the food in front of you slowly starting to heat up from the flames underneath it. 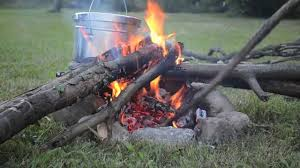 It is important to remember though that it is actually the heat from the coals or wood that you are using as a heat source that cooks the food, rather than the flames. The heat from the fuel is kept at a constant temperature and so cooks the food thoroughly and evenly whereas the temperature of the flames fluctuates depending on the section of flame that you are using. 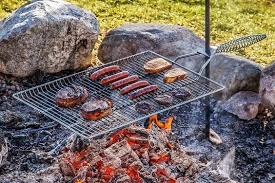 When choosing your heat source, you should ensure that any charcoal or coals are not coated in any type of lighter fluid as this will translate to the flavor of the food. If using wood, you should ensure that this is brown in color as green wood creates more smoke but loses heat so your food will take longer to cook, and the smoke excess smoke will make the experience a less pleasurable one.